A recent clinical study reported that the ingestion of apple juice (AJ) markedly reduced the plasma concentration of atenolol; however, our in vitro study showed that atenolol may not be a substrate of organic anion transporting polypeptide 2B1 (OATP2B1), so this AJ-atenolol interaction cannot be explained by inhibition of OATP2B1. On the other hand, we more recently showed that the solution osmolality influences gastrointestinal (GI) water volume, and this may indirectly affect intestinal drug absorption. In this study, we examined whether the osmolality dependence of water dynamics can account for AJ-atenolol interactions by evaluating the GI water volume and the atenolol aborption in the presence of AJ in rats. Water absorption was highest in purified water, followed by saline and isosmotic mannitol solution, and the lowest in AJ, confirming that water absorption is indeed osmolality-dependent. Interestingly, AJ showed apparent water secretion into the intestinal lumen. The intestinal concentration of FD-4, a nonpermeable compound, after administration in AJ was lower than the initial concentration, whereas that in purified water was greater than the initial concentration. 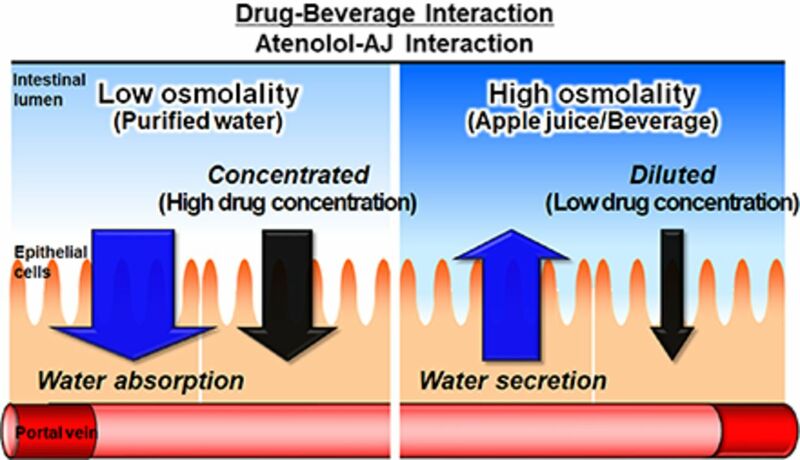 Further, the fraction of atenolol absorbed in intestine was significantly lower in AJ or hyperosmotic mannitol solution (adjusted to the osmolality of AJ) than after administration in purified water. Comparable results were observed in an in vivo pharmacokinetic study in rats. Our results indicate that orally administered AJ has a capacity to modulate luminal water volume depending on the osmolality, and this effect may result in significant AJ-atenolol interactions. ↵1 Y.F. and Y.S. contributed equally to this work. This work was supported in part by a grant-in-aid for Challenging Exploratory Research from the Japan Society for the Promotion of Science (JSPS) [Grant 16K15165] and research grant from the Japan Research Foundation for Clinical Pharmacology [Grant 2017A13].